ALL aspiring LLB candidates and practising advocates and solicitors who have emerged relatively unscathed from the grueling examination halls of English Law would recognise the name Lord Denning. He was the last United Kingdom judge not bound by the mandatory retirement age. The Family Story is the book that he had always wanted to write but couldn’t find the time. Finally, he did it and it was published in 1981. In Lord Denning’s own words, “it is a tale that is told by me”. Lawyers who studied and practised under the British legal system have always been fascinated with Denning, one of the greatest judges of modern times. This is the judge who sat on the Bench for 38 years and had redefined justice in his own unique ways. Many of his judgments have become talking points and landmarks of legal reasoning the world over. Denning’s Family Story is a very personal account of his parents and his brothers. There were five sons in the Denning household. Two of them died in the First World War. One became an army general, one an Admiral and Alfred Thompson was to become the most famous of the five brothers. He was the Master of the Rolls, the senior civil judge in the Court of Appeal of England and Wales. 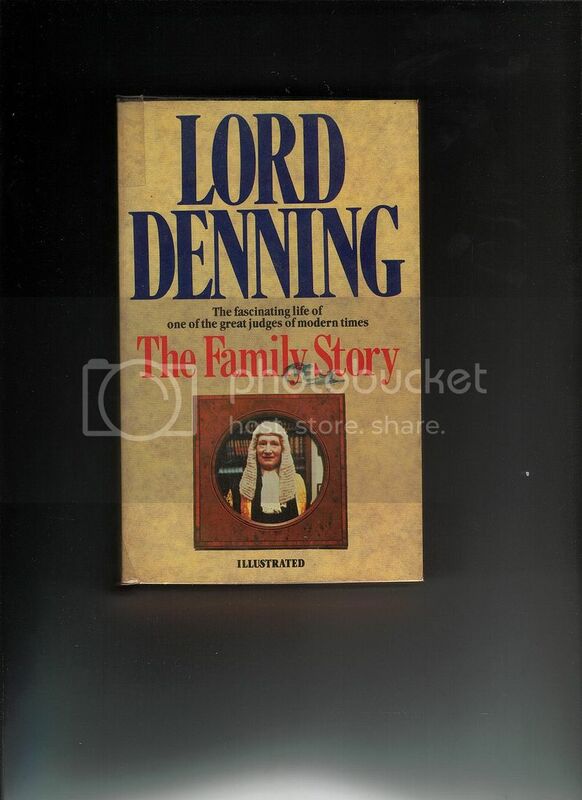 Denning’s account of his family history borders on a level that does not seem to reflect his exalted station in life. His reputation as a man of great learning hid the truth that behind that mind of astonishing legal proportions was a man of great humility. If the reader were to expect some lyrical prose of Shakespearean quality, he would be sorely disappointed. Lord Denning writes with a style that startles with simplicity. He talks about his brothers with great pride. His account of his family reveals the extraordinary ordinariness of their lives; that they are no different from many others in different vocations. The only exception was Denning had greatness thrust on him at an early age. First Class in his first love, law, seemed to come too easy for him. From then on, it was a career always on the ascent. It is in the pages when the learned judge talks about the legal cases he handled that his story rises to a whole new level. His sharp legal mind had no equal. His judgments were unprecedented in foresight and often astoundingly accurate and fair. His contributions to the English legal system are almost unequalled in scope and range. Admirers of Lord Denning will find this book a constant source of inspiration, and a great delight. Alfred Thompson Denning lived 100 years. Indeed he lived a long and fruitful life. None could begrudge such a great man’s claim to longevity. His mark on the Court of Justice is indelible. This book is just another testimony of a young English lad who was born to change the stoic face of the English law, and what a great judge he became.